Summary : History about VHDL (Learn VHDL with Naresh Singh Dobal Series). According to the records VHDL was initially initiated by US- DoD (United State – Department of Defense), They have initiated VHDL to design there complex architectures of electronics used in defense. But later this was transferred to IEEE for standardization. In 1985 All the rights of VHDL was transferred to IEEE. 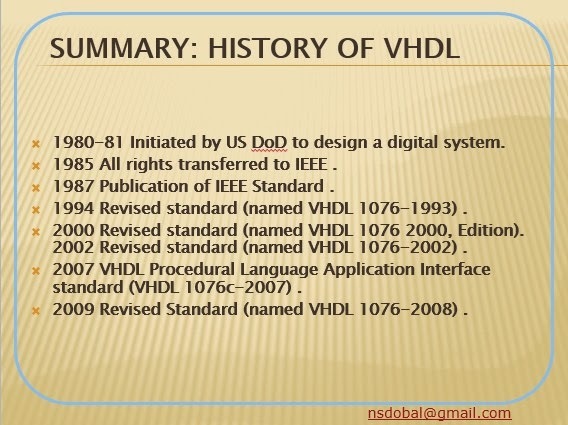 After two years in 1987 IEEE launched VHDL standards. In 1994 Revised edition of VHDL Standard was published which was named by VHDL 1076-1993. In 2000 again Revised Edition of standard was launched and named by VHDL 1076-2000. VHDL 1076-2002 was published in year 2002. VHDL 1076-2007 was published in year 2007. Recently in year 2009 VHDL revised edition VHDL 1076-2008 was published.